. Mangapps Railway Museum Southminster Road Burnham-on-Crouch Essex CM0 8QG . 01621 784898 .
from March to October inclusive and every day during August. From 11.30 am to 5.00 pm daily, last admissions at 4 pm. 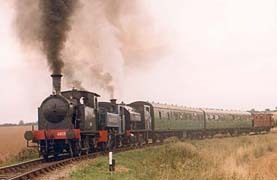 First train leaves Mangapps at 12.15 pm, then hourly until 4.15.
a major and ongoing overhaul of this website. We hope that you find the result interesting and enjoyable. Mangapps Railway Museum is a privately owned working railway and museum established on a farm at Burnham on Crouch, Essex. It features a ¾ mile standard gauge passenger carrying line, with restored stations, signal boxes and ancillary equipment removed from various sites throughout East Anglia and beyond. To operate the line the Railway has 18 steam and diesel locomotives and over 80 carriages and wagons, some of considerable historic and technical interest. To complement the working Railway, the Museum has a collection of smaller railway relics which is one of the largest of its kind in Britain. 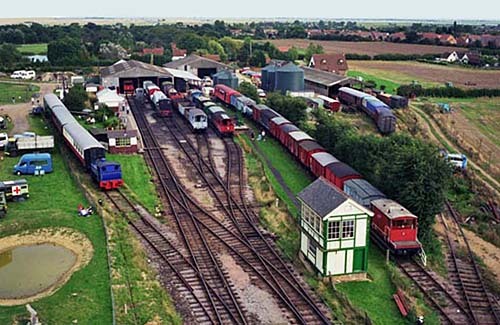 This collection contains historic items connected with every aspect of railway operation and has a particular bias towards the railways of East Anglia and Railway signalling - in fact the signalling collection is believed to be the largest on public display in Britain. 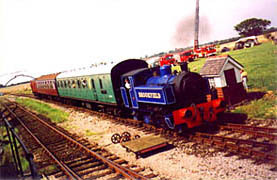 The Railway and Museum are owned and operated by the Jolly family assisted by a dedicated staff of volunteers.